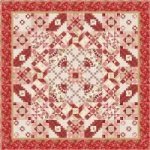 Over twenty years ago, Edyta Sitar discovered a passion for quilting that would change the course of her life. She is “sew in love”and is thrilled to be able to share this love with fellow quilters by introducing her Sweetheart blocks, a set of twelve quilt blocks that have stood by her through the years, in her new book Sew in Love. She has fashioned these Sweetheart blocks into a breathtaking block of the month sampler quilt with an qppliqué and straight-pieced option. 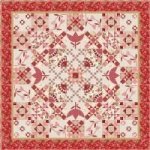 You can choose either option for this gorgeous 75 1/2" vey 75 1/2" quilt. The Sew in Love Block of the Month runs 11 months beginning August 2018. It includes the Sew in Love book and 17 yds of Sweetheart Fabric for quilt top and binding. Cost is $ 22.99 per month.